"Many problems related to diseases that afflict humans involve the capacity of infectious organisms to evolve and adapt," said co-author Susan Perkins, a curator in the Museum's Division of Invertebrate Zoology and a principal investigator in the Museum's Sackler Institute for Comparative Genomics. "We won't be able to fully understand human-infecting malaria parasites–and possibly, develop unique ways to fight them–until we know more about their evolutionary history." Mapping the relationships of malaria parasites is challenging on multiple levels. 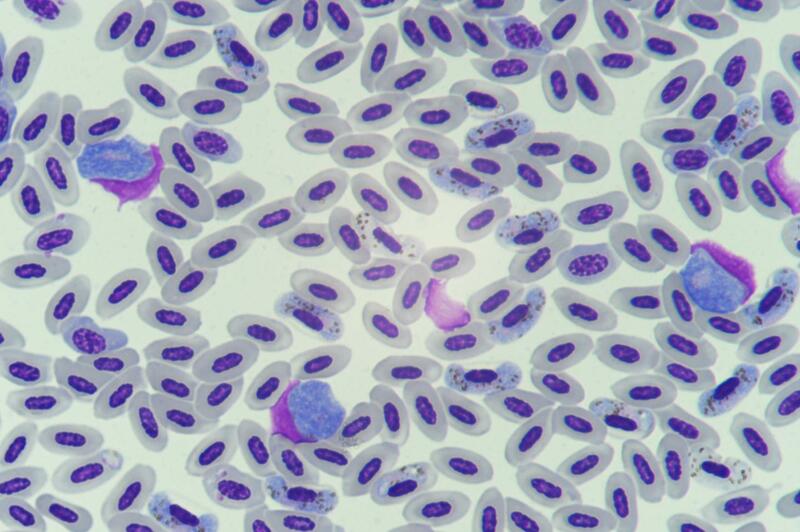 Many of these parasites are rare and difficult to sample, and tailored to infect specific species, such as a single type of green-blooded skink in New Guinea or bats in remote forests of Africa. Malaria parasites also have peculiar DNA: while most organisms have a relatively even proportion of the four chemical bases (A, C, T, and G) that make up the genome, these parasites' DNA is heavily biased toward A (adenine) and T (thymine) couples, with as much as 80 percent of their genome consisting of just these two bases. However, this bias is not uniform across the diversity of these parasites and not accounting for these disparate ratios can result in skewed results. The researchers, led by Spencer Galen, a comparative biology Ph.D.-degree student in the Museum's Richard Gilder Graduate School, found a way to correct for this phenomenon. Working closely with Museum research fellow Janus Borner, who developed new genetic markers for the group while at the University of Hamburg, they were able to include malaria species from deep evolutionary lineages–like those infecting deer, turtles, bats, and numerous species of birds–that were missing from previous analyses. The resulting tree, which sampled 58 malaria species from eight of the currently recognized genera and included DNA sequence data from more than 20 genes, is the most comprehensive of its kind. The team's most surprising finding was that the genus Plasmodium consists of several groups that are not each other's closest relatives, and therefore, from a taxonomic standpoint, many species should be renamed. Importantly, this affects Plasmodium falciparum, the deadliest species of malaria for humans. Because it is in a separate group from the so-called "type species" that defines Plasmodium, P. falciparum should receive a new name–but it's not so simple. The researchers do recommend the scientists adopt a new parlance for this group. Instead of referring to Plasmodium broadly, they recommend that scientists should be more specific and use the subgeneric names. This is because the evolutionary tree shows that not all of these parasites are transmitted by mosquitos or replicate inside red blood cells–the two key defining characteristics of Plasmodium. Additionally, other parasites that defy this definition are intermingled with the human parasites and the model species used to study the disease in the lab, including those that infect mice.